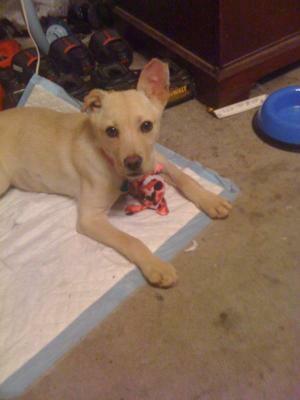 My name is Gabby,I am a yellow Lab and I will be 6 months old on the 15th of June. My first owners (who was very mean to me)made me into what they cal a "Bait Dog" whitch means they taught there pitt-bull how to fight by leting them bit an chew all over me. I now am missing over have my right ear and the tip of my left ear. The very nice lady from the shelter came and picked me up and fixed me right up. although Ii have a scar that runs from the top of my head to the bottom of my throat I am very greatful I am alive. Then on my 4 month Birthday 3 weeks later. My new forever mom came to get me. and now I have all the love and care I could have ever need. I'm not scared anymorre because I know I will never be hurt again. Thank you very much for letting me tell my story, hopefuly now people will see how important rescueing a pet really is. Very glad she is now in a good home, just remeber not all pitts are bad dogs its the owners that make them that way! So sad!